Just the other day I had a lengthy conversation with my friend Lynda about our mutual love of letterpress printing. Yes, sadly, that is the type of thing we have lengthy conversations about. 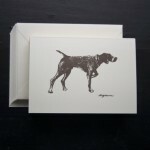 That evening while looking for some new notecards for the New Year, I came across these great letterpress notecards from Ancesserie featuring the image of a Pointer dog. Find these notecards and all the great letter press products of Ancesserie here. Lost Cowboy is powered by	WordPress 5.0.4 and delivered to you in 0.819 seconds using 48 queries.